SCVHistory.com LW3382 | Rancho Camulos | Postcard: 'Ramona at Camulos' (Not Really), ~1909. 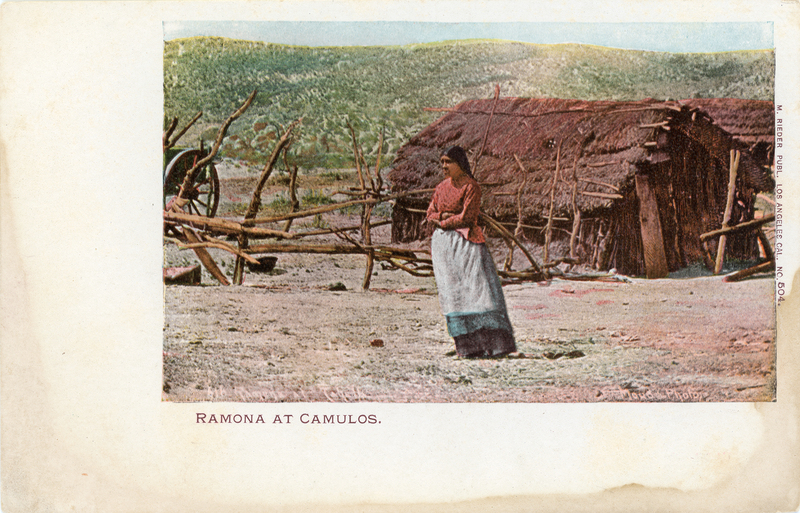 "Ramona at Camulos," souvenir postcard published by M. Rieder of Los Angeles, printed in Germany circa 1909. Uncredited photograph by George Wharton James, colorized. The postcard is a fantasy on numerous levels. It's complicated. Many of the settings for Helen Hunt Jackson's classic 1884 novel, "Ramona" — which, coupled with the railroad wars of the late 1880s, sparked a massive wave of migration to sunny Southern California — were based on Jackson's knowledge of Rancho Camulos at the western edge of the Santa Clarita Valley. The characters for the story were amalgamations of people Jackson observed and heard about during and after her travels throughout Southern California in 1882-1883, including but not limited to people at Rancho Camulos. The basic story line — the star-crossed lovers Ramona and Alessandro who end up together despite all odds, only for Alessandro to be murdered in a misunderstanding over a borrowed horse — dovetails with a real-life story with which Jackson was familiar, and which occurrence coincided with her visits and her subsequent correspondences with people she knew in Southern California. 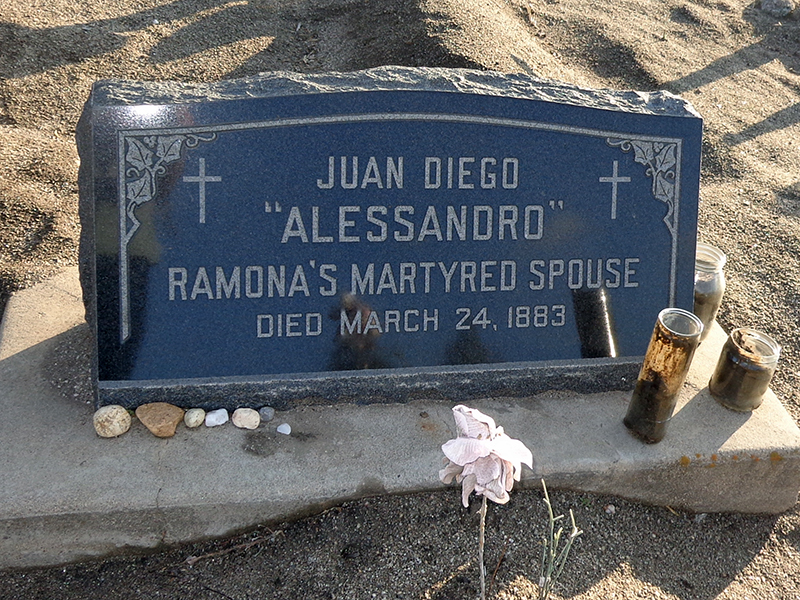 Even today, "Ramona seekers" won't be disappointed at the grave of Juan Diego in the Cahuilla Indian Reservation Cemetery. Photo: Findagrave.com. Click to enlarge. 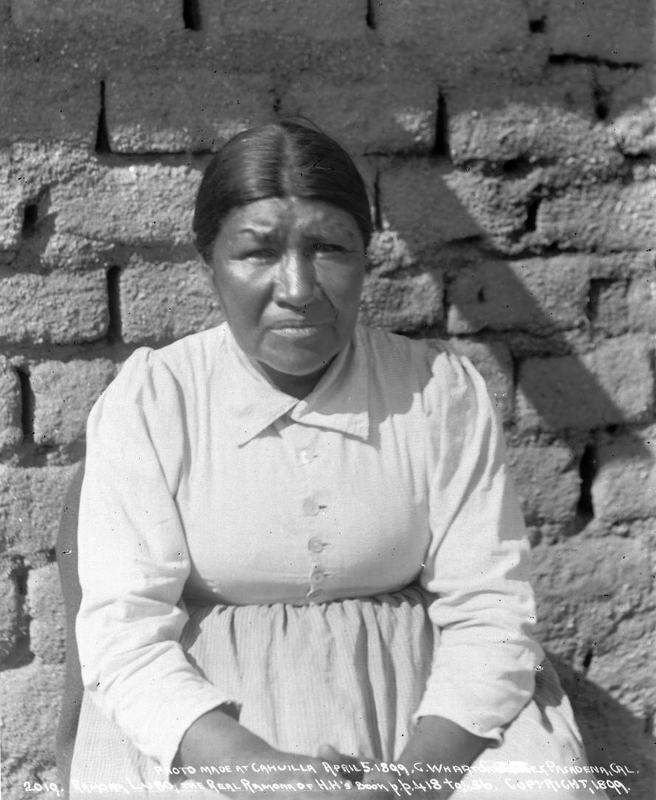 It was the story of Ramona Lubo (1853-1922), a Cahuilla Indian woman and master basket weaver who lived on the reservation in Riverside County; and her husband, Juan Diego, who was shot dead by Sam Temple for horse theft. Temple was acquitted in a San Jacinto court in 1883. The novel was the latest in a string of works by Jackson to raise awareness about the unfair treatment of Indians. The American public interpreted her book differently. Folks back East were attracted to Jackson's vivid and romantic characterizations of the bucolic Californio lifestyle and landscape. So they came, the "Ramona seekers," looking for the people and places in the novel. Apparently they didn't grasp the idea that novels are works of fiction. For her part, Jackson was deathly ill when she finished writing it. She died in 1885 before she could tell anybody whom or what she based it on. Not that she should have or would have done. People who were already in Southern California responded in different ways to the influx of Easterners and Midwesterners during the Tourist Period, which, initially fueled by deeply discounted railroad fares, lasted from about 1888 until the stock market crashed in 1929. Ramona Lubo at home, April 5, 1899. Photo by George Wharton James, whose caption identifies her as "The real Ramona of H.H. 's book." Another GWJ photo shows her holding a star basket she made in memory of her late husband — "Alessandro." Click to enlarge. At Rancho Camulos, the Southern Pacific Railroad established a whistle stop. The Del Valle family (owners of Rancho Camulos) accomodated overnight visitors and branded their citrus products with the "Ramona" label. There was an Indian village at Camulos at one time, but what's shown on this picture postcard isn't it. 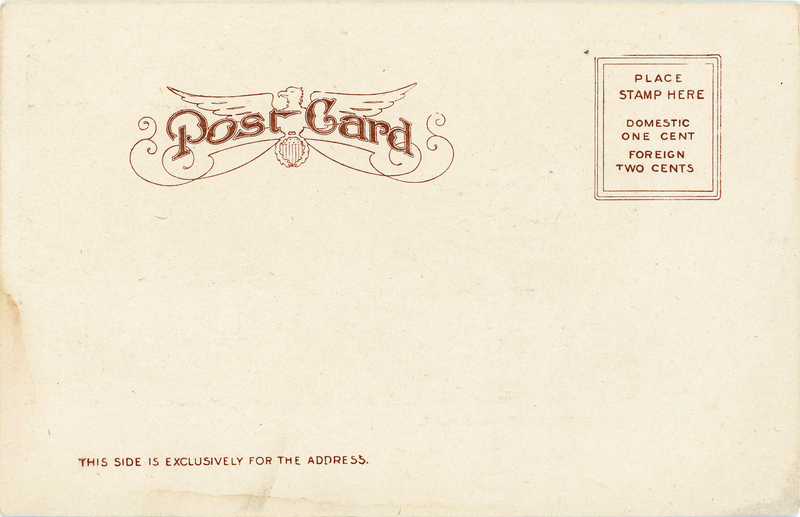 The postcard is miscaptioned at best, a fraud at worst. But it was typical of postcard publishers who also didn't miss an opportunity to capitalize on the Ramona craze. Countless postcards of the period are labeled "Ramona's home" at Camulos and "Ramona's marriage place" in Old Town San Diego. Rarely does a postcard meld the two locations like this one does. 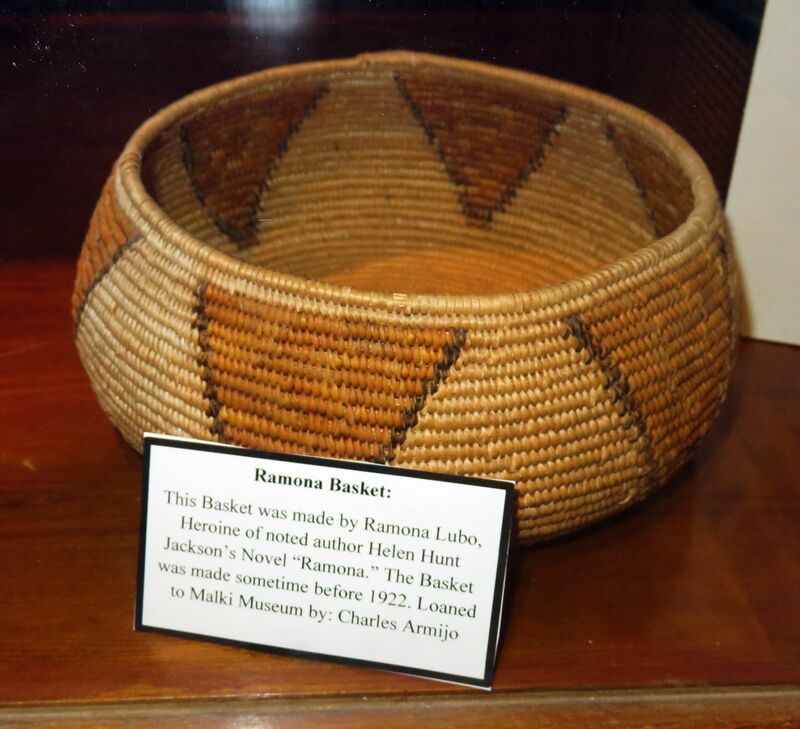 Basket attributed to Ramona Lubo in the Malki Museum, Morongo Indian Reservation, Riverside County. Photo: Leon Worden 2015. Click to enlarge. The photo by George Wharton James — journalist, author, booster, and one of the biggest popularizers of "Mission Indian" basketry during the early Tourist Period — does show the "real Ramona." It shows Ramona Lubo. Not necessarily the Ramona of the novel, but the real woman whose true-life story Jackson knew. It is one of several photos of Ramona Lubo that G.W. James made between about 1895 and 1905. The postcard shows Ramona Lubo at home on the Cahuilla Reservation in Riverside County around 1895-1900. The only thing about it that relates to Rancho Camulos is the printed text. LW3382: 9600 dpi jpeg from original postcard purchased 2018 by Leon Worden from a vendor in Austria.